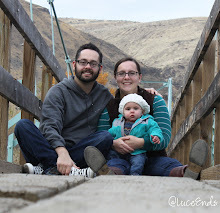 This is the first installment of three on How Our Family Started. Stacy and I met in High School. I had been praying fervently that I would meet my spouse soon, and in His divine and perfect irony, God granted my prayer: Both of us attended classes at the same co-op, but never spoke. Then Stacy graduated. We re-met at church. We had several mutual friends, which allowed us to strike up conversation. The conversations lead to a friendship, the friendship a relationship. After dating for 4 months and being engaged for 3, the relationship led to marriage. While we were dating we attempted to discuss everything with full disclosure (Communication is a KEY component of a marriage). Stacy brought up that, for medical reasons, it might be difficult for us to have "our own" kids. This lead to us agreeing that, if this was the case, we were ok with adoption and that we both were interested in adopting, even if we did have "our own" children. While this was a true sentiment, we both did not grasp fully the implications or weight of either infertility or adoption. After getting married in 2005, we did not immediately try to start a family. It wasn't until several months later that, between a better understanding of God's will and a convicting talk (ironically enough: about abstinence) at a high school retreat we were staffing, we changed our minds (It must be noted that abstinence was not the birth control method we were using...). It was soon very clear that difficult was an understatement when it came to the chances of our getting pregnant. After a workup at the doctor and more than a year of trying low-key treatments, the physician indicated that the only option they had left to offer was IVF. This left us confused, sad, and unsure of what to do next: infertility and miscarriage bring a pain that is hard to explain or deal with. You grieve for the children you might have had, or were carrying and lost. You grieve for feeling alone, or useless, broken, or to somehow to blame. You grieve when others who have children complain, or take them for granted. You grieve for the uncertainty of the future, the starkness of the present, and the dashed hopes of the past. Frequently the pain is brought up sharply: "If you don't have children, get busy." "You've been marrried how long? Where are all the kids?" "I knew someone that ____ and then they found out they were pregnant!" Conversely, some people suggest that you are "not supposed to have a family," or even twist scripture to indicate that you are being punished. Other times the trigger is subtle: Attending a wedding, and then the though of never giving away a daughter. Watching a sports game, and then the thought of never playing soccer with a son. A friend joyfully (and rightly so) announcing that they are expecting a child. Baby furniture received as a gift, still sitting empty. All that is you, your faith, identity, and being are tried and challenged. Through this time, we did know that God still loved us and His plan for us had not changed, but it was still hard to always find joy in Him. Admittedly, the reponse to the pain of infertility easily turns to anger, jealousy, or defensiveness. Though sinful beings, hopefully Stacy and I have weathered the pain well and, through Jesus grace, to His glory. Well written... :) I'm so happy for this journey you are all on! What a blessing you are to others with your story, thank you for sharing it. "You grieve for the children you might have had, or were carrying and lost. You grieve for feeling alone, or useless, broken, or to somehow to blame. You grieve when others who have children complain, or take them for granted. You grieve for the uncertainty of the future, the starkness of the present, and the dashed hopes of the past." Well said... and boy, do I hear you. You practically picked the words right out of my heart. Hi Stacy, I think you were looking for a used stroller to trade in, do you still need one? I have one you can have, just don't have your email address to get in touch.